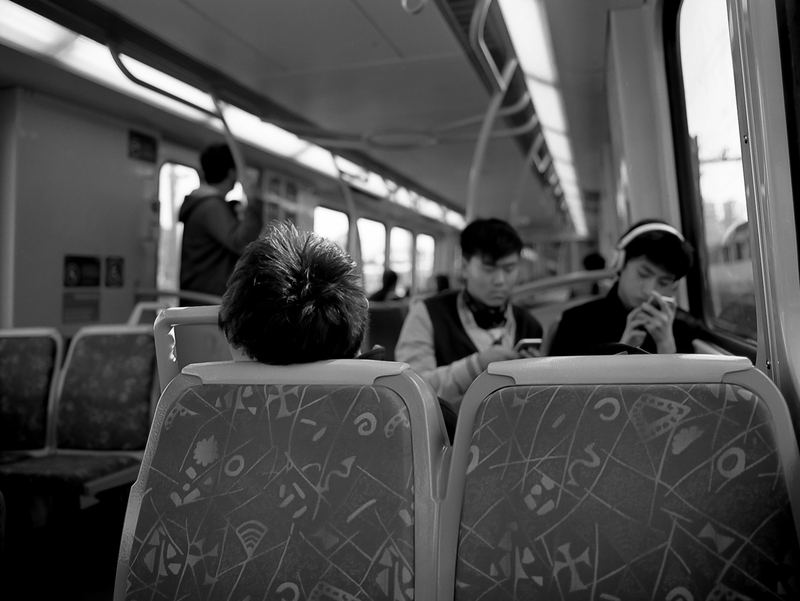 What does “story telling”mean in street photography? Defining “story telling” in a way that is relevant to street photography is not completely obvious to me yet – it will take me some time to develop a clear style or techniques to help. The first few steps seem to be about bringing multiple planes of subjects into the image. “Layers” of a scene, rather than a single two dimensional “slice”. Many of the images I take seem to be a single “slice” of an aesthetically pleasing scene and can sometimes feel a bit flat. On the last couple of shoots out in the CBD, I have been focusing on trying to find scenes with a complexity of layers. Not just a single subject or scene. Contrasting different subjects in a single frame. This is the image that seems to have achieved the most, shot on medium format using a 50mm lens. Moving in close to the seagull with wide angle lens allowed a broader scene into the frame. The couple are close and affectionate with each other. 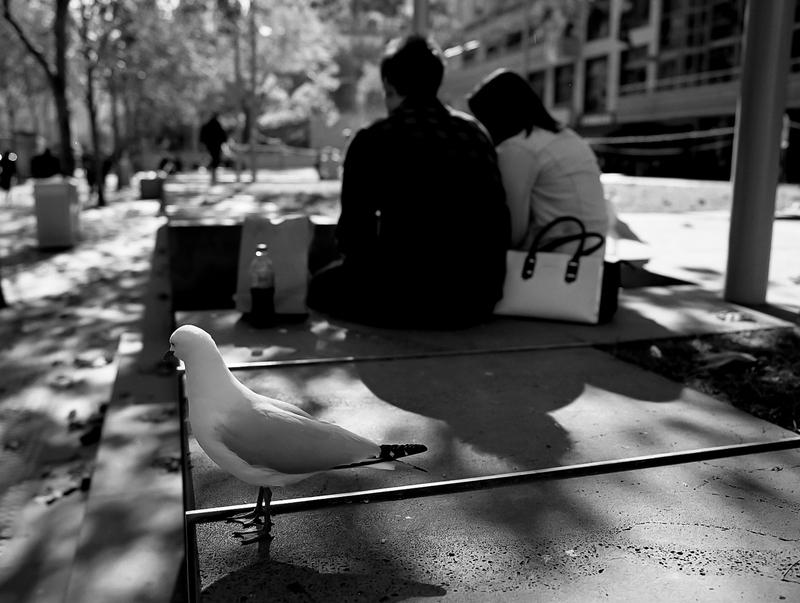 The seagull provides some additional interest into the image and is on a different plane in the image to the couple. The bird is kinda playing the role of “witness” or “watcher” and brings a further sense of peace in a busy city, being calm and quiet. From a technical perspective, there is probably a little too much contrasty shadow action in the image, distracting from the subjects. I only rarely shoot people who are focused on their phones. At first, it seems to be like “shooting fish in a barrel” for street photographers, until you realise that you end up with the same image every time. The lack of engagement people on their phones seem to have with the world around them usually translates the same for me in the end images – they lack the ability to evoke interest from the viewer. I thought this image worked as a broader story, though. The kid facing away from the camera is the focus subject. You wonder and want to imagine what he is doing. The kids are clearly a friendship group, comfortable together but not feeling the need to interact with each other. The main subject seems to be very relaxed and appears to have adopted a classic “slacker” pose on the train – slouching as much as is humanly possible. This contrasts with the two subjects facing the camera on their phones. There is not as much interest as Image One, but at least there are two layers to the image, so it was a step forward. A third attempt at bringing story telling into images! The story tries to come from the juxtaposition of the “Big Issue” seller vs the guy handing out info on a Islamophobia demonstration. There is an interesting contrast between the “big issue” for the relatively well dressed and probably well educated Islam guy vs the more gritty “big issues” the paper seller faces on a daily basis. There is a suggestion that both of them are relatively invisible to the pedestrian traffic around them – what is important to each of the subjects is not having much of an impact on the world around them in the moment that the image was taken. There is a nice balance of visual weight between the two focus subjects – they are mostly evenly weighted, slightly in favour of the LHS subject. There is a clear entry point on the left of the frame, which tails off to the RHS subject. The image has a mirror image / reflection feel where both subjects are facing “inwards”. The shadows in the image continue the journey of the eye from left to right by offering parallel lines to draw the eye. 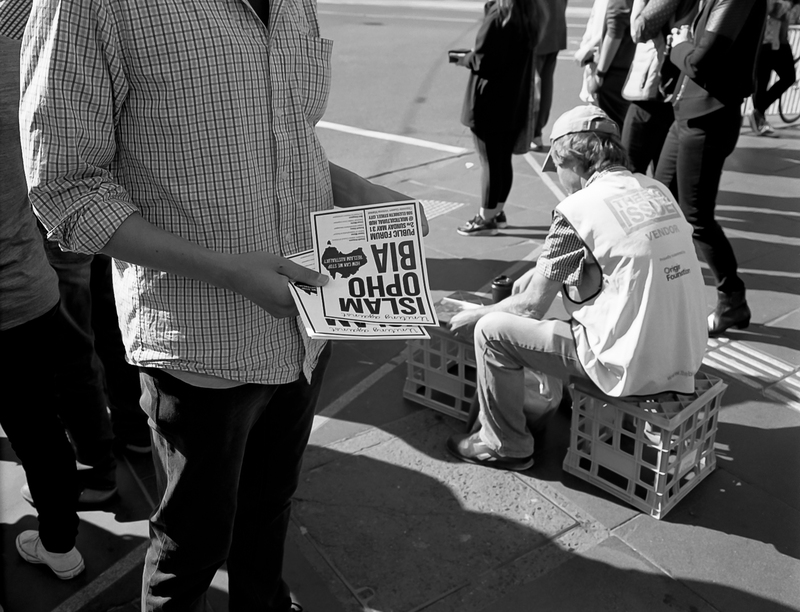 An increase in the dark weight of the “big issue” logo on the seller’s safety jacket would help the clarity of the story. I was shooting with a red filter that particular day, so this may have impacted the strength of the red logo. Overall, the image is an OK step in the right direction. There are multiple planes creating interest but it is not a particularly compelling step forward. The image feels quite a bit cliched or overt perhaps? I don’t see what other people see. Additional layers of meaning and story don’t always appear to me from a scene as they do to some other photographers. Knowing this is a bit of a blind spot for me, concentrating on simply spotting images with multiple layers to create a more complex image for the viewer to explore is probably the best path forward. Fake it till you make it! Achieving layers of meaning often requires finding a spot where many of the layers are already in place and waiting for the final layers to arrive. I lack the patience (or the fore-thought) to do it. Sometimes I get a happy accident, but infrequently. If you want a stronger narrative you need to have the eyes and faces of your subjects visible. This is not everyone’s strong point, and requires overcoming fear sometimes. But the story is half written already.